The budget proposal put forth by Paul Ryan is a vicious and cruel all-out attack on everyone under the age of 55, but the cuts to Medicare and Medicaid that the Ryan plan proposes would be felt acutely by women, who make up more than half of the beneficiaries of both programs, and women retire closer to the poverty line than men do. Women who are alone, who either never married or who are divorced or widowed and never remarried would be particularly vulnerable. The attack on Medicare is one that rallies everyone. Not everyone over 55 is a psychopath who couldn’t care less so long as they get theirs. I honestly think that Paul Ryan was counting on people over 55, the largest republican voting bloc out there, not giving a damn so long as they got to keep theirs. I think he is so steeped in Randianism that he was taken aback by the pushback he got from people who actually care about their kids and their younger siblings and everyone else who paid in all their adult lives and stand to get rogered roundly if Ryan’s scheme sees the light of day. Here is the bottom line: Ryan’s plan would amount to transfering the entire monthly Social Security benefit for female seniors to private health insurance companies. I can’t possibly sum it up any more succinctly than Senator Barbara Boxer did when she said “This is a sick proposal,” during a press conference with other Senate Democrats last week. As bad as that is, the assault on Medicaid is even worse. Women comprise about 70% of all Medicaid beneficiaries, the Medicaid program has been demonized and branded as welfare, as “free” healthcare for “those people.” The right-wing social conservatives have been very successful in projecting the face of Medicaid as an inner city “welfare mother” with several children, presumably with different fathers. That is the implication, anyway, when GOP politicians dismiss Medicaid as a progenitor of promiscuity. But in reality, most Medicaid recipients are elderly or profoundly disabled people in nursing homes, and the idea of making Medicaid a block grant that states could use to deliver healthcare as they saw fit would only make matters worse. States have already mucked up their end of the joint federal-state program, and block grants would make matters far worse. The CBO estimates that Republicans’ proposed plan to block-grant Medicaid would reduce federal program expenditures by 35 percent by 2022 and by 49 percent in 2030 relative to current law. In return, states would have greater flexibility to restructure Medicaid benefits. How governors would actually use this flexibility is another matter. Medicaid is flexible right now. The Center on Budget and Policy Priorities reports that about 60 percent of state Medicaid spending consists of expenditures to cover people or to reimburse services that are not required under federal law. Given Medicaid’s low per-person cost and its relatively restrained projected cost growth, there’s little room to comfortably cut. Safety-net services are already shoestring operations. Under-funded and stressed, they have many shortcomings. There is no way to meet the above spending reduction targets without shifting costs and risks onto the states, covering markedly fewer people and services, or further underpaying Medicaid providers. Do you wonder to whom the care of those elderly and disabled people would fall if Medicaid went away? I can tell you who it would fall to — it would fall to women, mostly in their forties and fifties, women would have to leave the workplace to care for their elderly parents or disabled siblings or children, high-need individuals whose nursing home care would no longer be paid for. This in turn would reduce the amount of Social Security benefits those women would receive upon retirement, to the point that these women would end up paying every single penny of their retirement benefits, for which women worked all their adult lives to private companies because Medicare is gone. Yes, there is a war on women, and it isn’t just being waged against those in their childbearing years. They really are out to get us all. And no, I’m not paranoid. It’s only paranoia when the threat is imaginary, and this one is not; it is quite real. 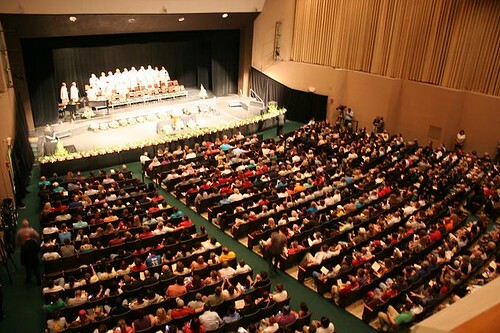 Missouri Southern State University prior to the start of the Joplin Community Memorial Service on May 29, 2011. 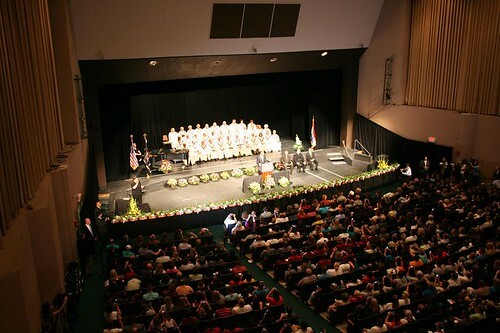 The “Joplin Community Memorial Service” took place on Sunday afternoon at the Taylor Performing Arts Center on the campus of Missouri Southern State University. 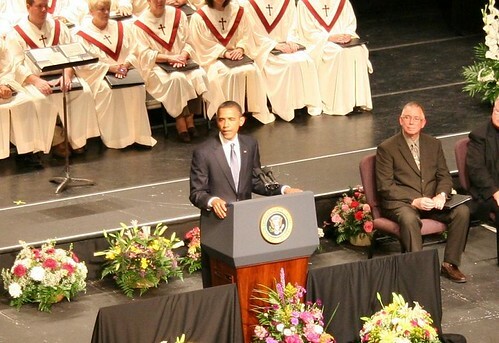 Members of the clergy from Joplin spoke, as did Missouri Governor Jay Nixon and President Barack Obama. 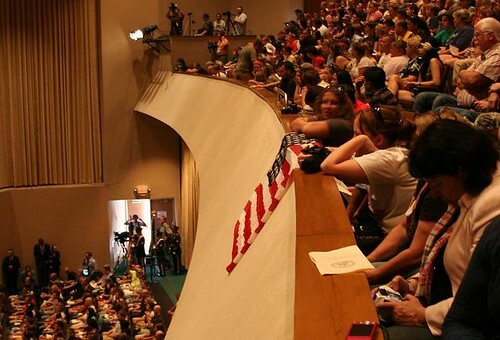 The view from a television camera in the balcony – Tulsa, Oklahoma ABC affiliate. 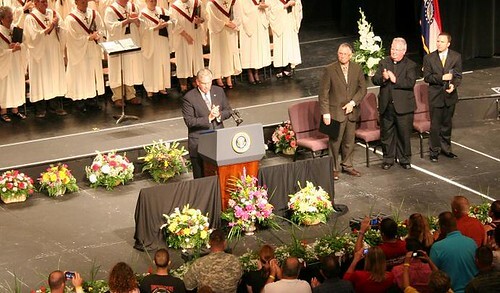 Missouri Governor Jay Nixon is welcomed by the audience. …. 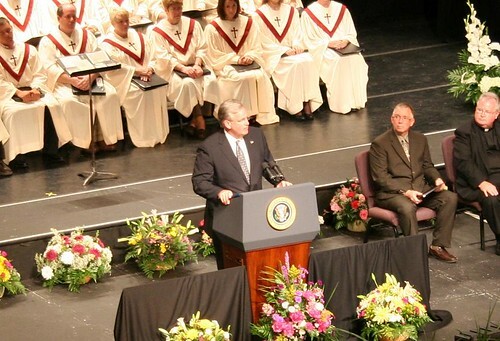 [applause] Governor Jay Nixon: Thank you, Pastor Gariss. To the families of those who were killed and injured, to the families of those who are still unaccounted for, to the people of Joplin who have endured this terrible tragedy, to the thousands of Missourians and citizens across the nation who have opened their hearts to help us heal, to the hundreds of firefighters and emergency responders who came without hesitation to climb over piles of rubble in search of survivors, to Pastor Garris, Pastor Brown, Father Monaghan, Lieutenant Colonel Kilmer, and the wonderful choir from First United Methodist Church of Joplin, and to President Obama who is with us today, thank you all for coming. 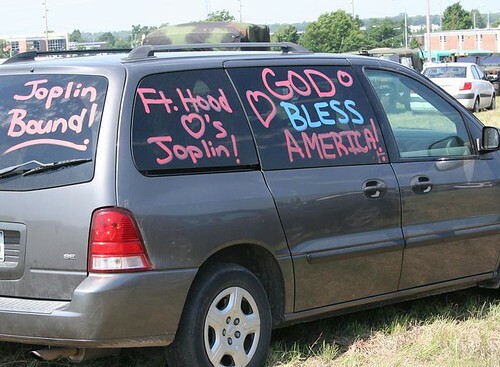 …What our nation and our world have witnessed this week is the spirit of Joplin, Missouri. [voice: “Amen.”][cheers, applause] And we are humbled by it. You have given “love thy neighbor” new meaning. The parable of the Good Samaritan in Luke, chapter ten, verses twenty-five through thirty-seven begins with a conversation between Jesus and a student of religious law. It starts with a legal question and ends with a moral imperative. The student asks Jesus, What shall I do to inherit eternal life? And Jesus turns the question around and asks, what is written in the law? And the student, who is well-versed in the Talmud and the Torah, replied, thou shalt love the Lord thy God with all thy heart, with all thy soul, with all thy strength and with all thy, thy mind. And thou shalt love thy neighbor as thyself. And Jesus replies, thou hast answered right. This do, and thou shalt live. But then the student, wanting greater clarity than the law provided, asks Jesus, and who is my neighbor? And Jesus tells him the story of the Good Samaritan. From that parable our charge is crystal clear, Good Samaritans do not pass by those who are suffering and in need. They show their compassion with action. In Joplin, you see Good Samaritans everywhere you turn. You see them over in the gym at this university where hundreds of volunteers make sandwiches each and every day. You seem them passing out blankets, pillows, sunscreen and flashlights to our neighbors made homeless by the whirlwind. You need a flashlight. Because it gets pretty dark here at night, especially when you’re standing in the street staring at the lonely pile of matchsticks that was once your home. If you had been in the ER at St. John’s Mercy Medical Center last Sunday evening, mere moments after the tornado struck, you would have seen Good Samaritans rushing frantically to reach the wounded and the dying. Shattered glass and bleeding patients everywhere, water and gas spewing from burst pipes, one doctor stumbled through the darkness with a flashlight in his teeth following the wail of a wounded child. rebuild upon a granite foundation of faith. What we build on this hallowed ground will be a living monument to those we lost, mothers, fathers, our precious children. It will be a monument to the will and determination of the hundreds of men, women and yes, even children, who helped their neighbors dig out of the ruins, a monument to the search and rescue cue, crews who came swiftly to aid the quick and [inaudible]. By God’s grace we will restore this community. And by God’s grace we will renew our souls. Before he takes the podium I’d like to thank President Obama [cheers] for his [inaudible] [cheers, applause] for this, for his tireless efforts [inaudible] resources to communities from Joplin to St. Louis, Sedalia to the bootheel, all across our country, and to communities across the nation who are struggling to recover in the aftermath of deadly storms and floods. The weight on your shoulders is heavy. We will continue to need that help in the months and years to come. 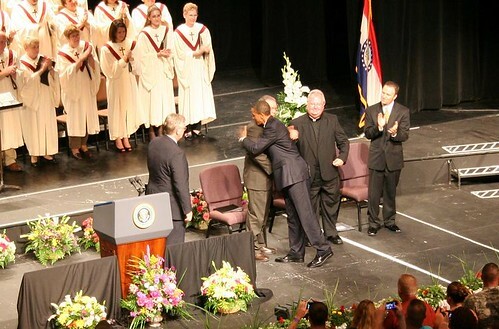 President Obama greets a member of the clergy after his introduction by Governor Jay Nixon. which was a designated parking area for those attending the memorial service. 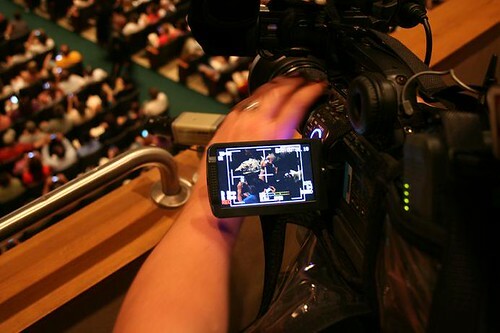 Blue Girl and I made the round trip drive to Joplin (about four hours each way for a total of over 400 miles) to cover the “Joplin Community Memorial Service” on Sunday afternoon at the Taylor Performing Arts Center on the campus of Missouri Southern State University. 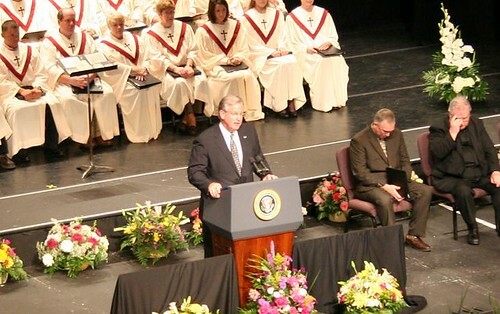 Members of the clergy from Joplin spoke, as did Missouri Governor Jay Nixon and President Barack Obama. Statewide officeholders in attendance included Senator Claire McCaskill, State Treasurer Clint Zweifel, and Attorney General Chris Koster. 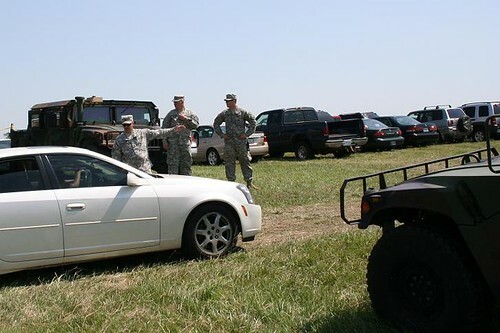 The Missouri National Guard controlled the perimeter of the campus and directed those attending to parking. 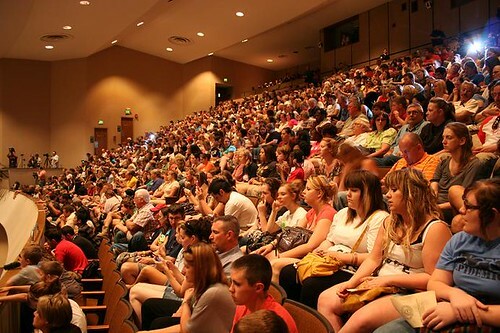 The audience in the balcony. A few minutes before the memorial service began these individuals on the first row of the balcony unfurled an American flag. 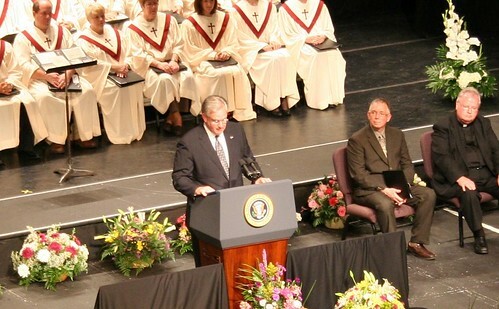 Missouri Governor Jay Nixon spoke and then introduced President Obama. 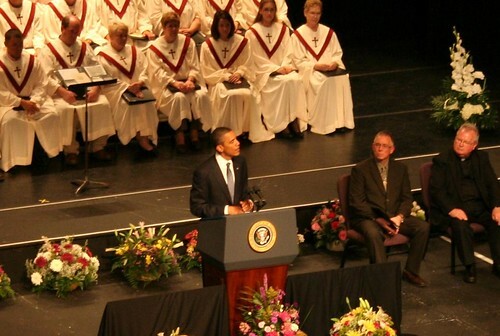 President Obama on the stage. 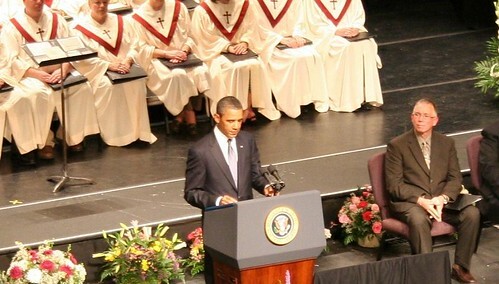 [cheers, applause] ….President Obama: Thank you. Thank you so much. Please, please be seated. 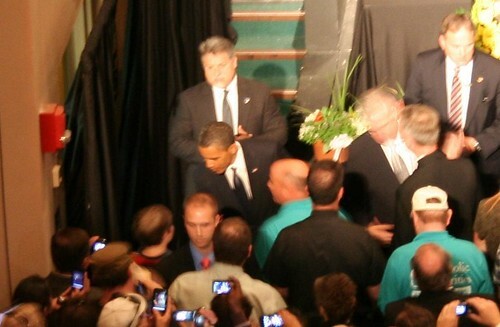 President Obama: I love Joplin! [applause] I love Joplin. 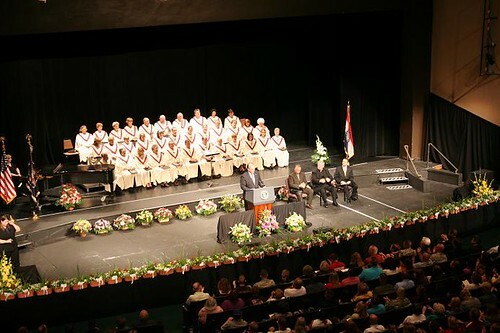 …Today we gather to celebrate the lives of those we’ve lost to the storms here in Joplin and across the Midwest, to keep in our prayers those still missing, to mourn with their families, to stand together during this time of pain and trial. And as Reverend Brown alluded to, the question that weighs on us at a time like this is, Why? Why our town? Why our home? Why my son, or husband, or wife, or sister, or friend? Why? As the governor said, you have shown the world what it means to love thy neighbor. You’ve banded together. You’ve come to each other’s aid. You’ve demonstrated a simple truth, that heartbreak and tragedy, no one is a stranger. Everybody is a brother. Everybody is a sister. [applause] We can all love one another. As you move forward in the days ahead, I know that rebuilding what you’ve lost won’t be easy. I just walked through some of the neighborhoods that have been affected, and you look out at the landscape, and there have to be moments where you just say, where to begin? How to start? There are going to be moments where after the shock has worn off, you feel alone. But there’s no doubt in my mind what the people of this community can do. There’s no doubt in my mind that Joplin will rebuild. And as President, I can promise you your country will be there with you every single step of the way. [applause, cheers] We will be with you every step of the way. We’re not going anywhere. [applause] The cameras may leave. The spotlight may shift. 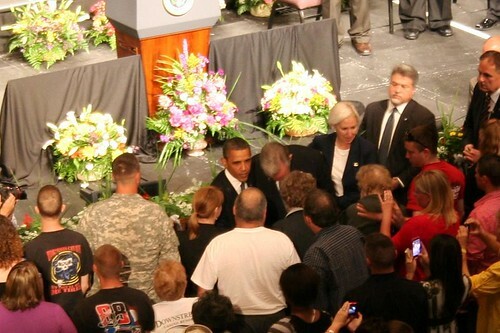 But we will be with you every step of the way until Joplin is restored and this community is back on its feet. We’re not going anywhere. [applause, cheers] That is not just my promise, that’s America’s promise. It’s a promise I make here in Joplin, it’s a promise I made down in Tuscaloosa, or in any of the communities that have been hit by these devastating storms over the last few weeks. You see, there are heroes all around us, all the time. They walk by us on the sidewalk, and they sit next to us in class. They pass us in the aisle wearing an orange apron. They come to our table at a restaurant and ask us what we’d like to order. Just as we can’t know why tragedy strikes in the first place, we may never fully understand where these men and women find the courage and strength to do what they did. 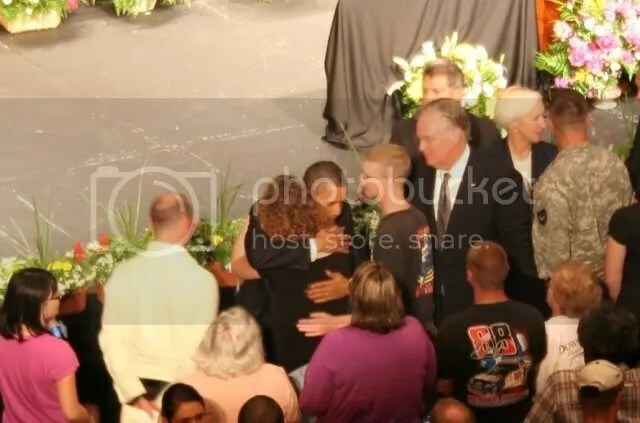 What we do know is that in a split-second moment where there’s little time for internal reflection or debate, the actions of these individuals were driven by love, love for a family member, love for a friend, or just love for a fellow human being. That’s good to know. In a world that can be cruel and selfish, it’s this knowledge, the knowledge that we are inclined to love one another, that we’re inclined to do good, to be good, that causes us to take heart. We see with fresh eyes what’s precious and so fragile and so important to us. We put aside our petty grievances and our minor disagreements. We see ourselves in the hopes and hardships of others. And in the stories of people like Dean and people like Christopher, we remember that each us contains reserves of resolve and compassion. There are heroes all around us, all the time. And so, in the wake of this tragedy, let us live up to their example [applause], to make each day count, to live with the sense of mutual regard, to live with that same compassion that they demonstrated in their final hours. We are called by them to do everything we can to be worthy of the chance that we’ve been given to carry on. 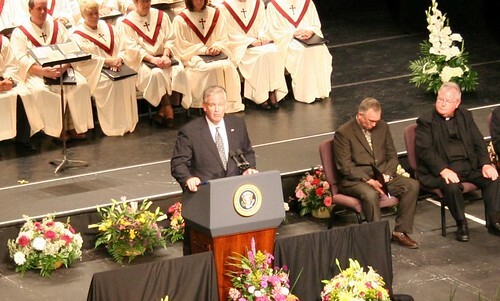 After President Obama’s remarks, a closing hymn, and a benediction by Father Justin Monaghan the President and Governor Jay Nixon greeted tornado survivors in the front rows of the auditorium. 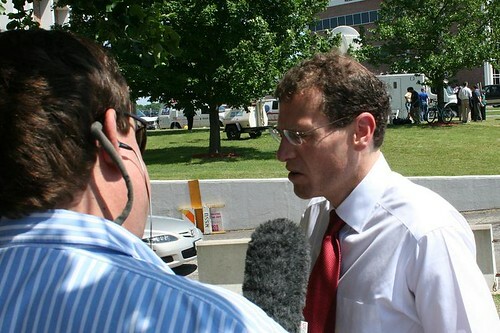 Missouri State Treasurer Clint Zweifel speaks with a radio reporter about the memorial service after the service. 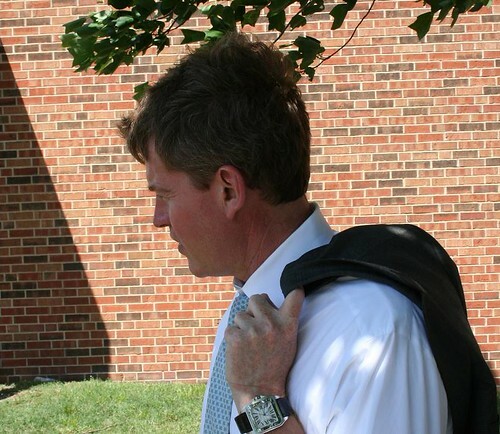 Missouri Attorney General Chris Koster speaking with individuals outside after the service. 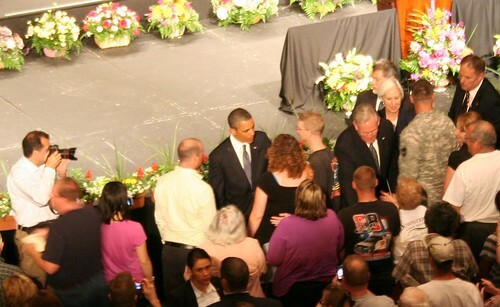 Joplin, Missouri came together today to mourn their dead and celebrate the lives of those they lost, and Governor Jay Nixon and President Barack Obama were there to mourn with them and celebrate the strength and resolve of our fellow Missourians who are recovering from an unimaginable disaster. 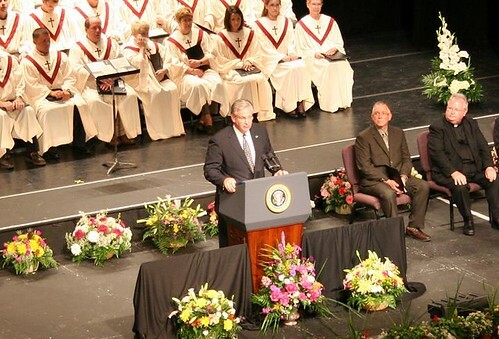 Governor Nixon delivered one of his better speeches, and then President Obama took the podium to deliver a 15 minute address that wove the stories of the heroes who emerged that fateful day, some sacrificing their own lives to save others, without a moment of hesitation in with stories of the Good Samaritans who came to help afterward — like the volunteers who drove straight through from Tuscaloosa to help, because when they needed help, they got it, and they were moved to return in kind the kindness they had been shown. 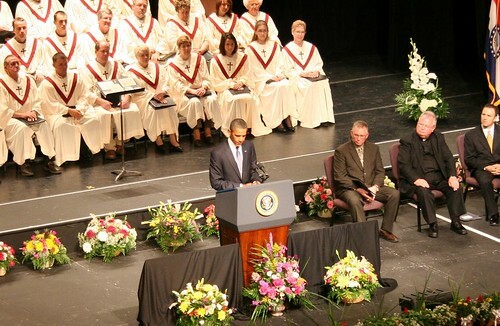 He ended his address with a recitation of the words to Amazing Grace, a comforting and appropriate choice, in this situation. The first thing I noticed as I approached my sister’s town of Montrose, PA, was the traffic. My last visit was four years ago, and the town had changed a lot even then, but I don’t remember so much truck traffic on the one lane road through town. My sister is one of the more educated residents of Montrose, and she believes the gas company propaganda. So what hope is there for this sad little town? They believe the gas company has saved them from becoming a ghost town. Most of the other job opportunities have dried up or moved too far from town to make it reasonable to commute to work. My sister said the noise continues 24/7 except for Sunday mornings. I’m guessing that was part of the deal. The gas company allows the people a few hours of peace and quiet each week. At dinner, I asked my niece and grand-niece what they thought of the gas drilling. They see it as a mixed blessing. On the one hand, the money the workers make gets recycled in the community as they pay rent, shop, and eat in the diners. On the other hand, with all the new workers bidding for apartments, the rents have shot up and forced longtime residents out of those apartments. My niece said there is a lot of tension among farmers who used to be close friends because some want the drilling and pipelines on their property and others don’t. She observed that “People aren’t working as hard as they used to.” I understood that to mean the new money is tempting farmers to give up growing crops. Coincidentally, my niece’s husband sells farm equipment which may be why he has noticed the changes in farm productivity. My grand-niece is 20 years old and more aware of the environmental damage caused by fracking. She said she wished Pennsylvania had done the same as New York State and established a moratorium until more is learned about the consequences of this type of drilling. Montrose is about 30 miles north of Scranton and only 25 miles from Binghamton, NY. I asked whether the gas company was going to pay to fix the roads their trucks are tearing up. Evidently, some money is going to the local road department, but the taxes being paid by the drilling company to the state probably won’t come back to the local area, according to my niece. They are not optimistic about their roads being repaired. So I paid closer attention, and saw that some of the tanker trucks were labeled “fresh water,” and some were labeled “residual waste.” But there were hundreds of dump trucks abd flat bed trucks loaded with rock too. I learned later that there is also a bluestone shale quarry nearby that has been in business for years. So maybe the local folks are so used to truck traffic that a few hundred more a day doesn’t bother them. It’s like the frog in the boiling pot metaphor. The destruction of this quiet little town has been so gradual, and they are so desperate for income, that they don’t even notice the earth shattering noise a few feet from their doors. When an older woman was ready to leave the diner and had to cross the street, three people sitting near her offered to walk her across the street. They joked about how easy it would be to get rid of a crabby relative by pushing him or her into the traffic. I’m not a mental health professional, but joking about something you hate but can’t do anything about must be listed somewhere as an indicator of emotional stress. Keep in mind that these roads were built decades ago to handle local traffic and maybe some vacationers on their way to the Pocono Mtns. One lane in each direction, no shoulders, no sidewalks, no grassy right-of-way spaces. The difference between the store parking lot and the lane of traffic is about the size of your shoe. My own observation of what is happening to these small towns in NE Pennsylvania is the same as many others. All over America, people are so desperate for jobs with enough income to live on that they are willing to work under any conditions, never complain and allow themselves to be dehumanized so gradually that they don’t notice how much their quality of life has been diminished. It used to be that an educated or trained person could count on a good job with benefits. Not any more. Our Corporate Masters have enslaved us by eliminating our choice of occupation and power to bargain for better pay and working conditions. I saw several young women standing near cars and old pickups loaded with household goods. These are the new Okies. Families travel wherever they can find jobs, living out of their vehicles when necessary, hanging on to whatever shred of self respect they can muster. This is what has been done to us over the last few decades, and it has been all planned out by the greedy bastards who don’t give a damn about small town folks or their communities. I hope I live long enough to see the current rumblings of protest around the country erupt into an overthrow of corporate power. Sen. Brian Nieves showed his psychotic side on May 11 in his Jeff City office. The three retired teachers who visited him that day have written of their experience in the Washington Missourian. Read their letters here. For visuals of the crazy man in action, watch this video. The FiredUpMissouri website is doing a great job of collating all the bits of evidence regarding Nieves’ mental state. Democrats should get a candidate ready to run in a special election for the 26th Senate seat because Nieves’ mental condition, according to a psychiatrist friend of mine, is on target for a complete breakdown soon. I know two of the three men who wrote letters to the Missourian, and I can attest to their solid character and completely non-violent personalities. One of them, in fact, started his career in the Catholic faith as a teaching brother and is totally incapable of saying or doing anything to offend anyone. The way Nieves turned his misbehavior into an attack on the two men he assaulted verbally is typical of people who are paranoid. Saying that he is defending his family is nuts, nuts, nuts. His family is alone 4 days a week while he’s in Jeff City, and, according to Nieves’ own testimony on the Senate floor, they are all “excellent shots.” It doesn’t sound like his family has to worry about being attacked. In fact, they sound like the kind of people to stay away from. Let’s just hope and pray Nieves doesn’t kill someone before he is rounded up and committed to a mental hospital. The initiative fundraising clash over the development of an office building on the Knasas City Plaza continues. …Since 1978, Highwoods Properties has been providing high-quality service and offering well-designed spaces for office, industrial and retail customers. As a publicly traded (NYSE:HIW) real estate investment trust (“REIT”) and a member of S&P MidCap 400 Index, Highwoods has nine local divisions that service 12 markets across the Southeast and Midwest United States, providing leasing, management, development, construction and other customer-related services for our properties and for third parties. For more than 13 years, Highwoods has had a presence in Kansas City and currently owns, leases and manages more than 2.2 million square feet of office and retail space including the world-renowned Country Club Plaza….